I have had numerous reports of drier than normal corn silage this year. It is hard to post a blog that answers all the questions about corn silage. Nutrient analysis of corn silage, dry matter, nitrate levels, analysis of other feedstuffs, cow size, cow condition, environmental factors, and many more variables can impact the amount of corn silage you need to feed. I recommend you consult your nutritionist or extension specialist on your specific situation. 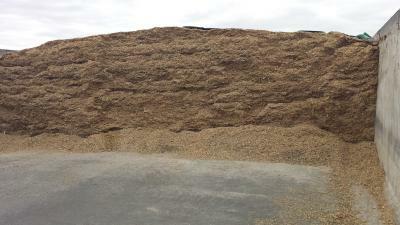 Dry Matter (DM): Rainy days kept many from harvesting corn silage at the correct time this year. Matter of fact, many corn silage bags will test pretty dry. Some may be 50% DM. This could pose some challenges to fermentation and increase spoilage on the face of the bag/pile. It can also open the door for molds. Thus, I strongly recommend sampling your corn silage and getting a nutrient analysis. If molds are present, the silage should be analyzed for that as well. Protein/Energy makeup: Dry corn silage may be a bit lower in protein, but corn silage is mainly used for energy. In fact, corn silage can offer too much energy to gestating cows if intake is not limited. In most cases, it is least-cost to supplement some protein and limit-feed the silage to meet energy requirements. If your silage is dry, cows may consume much more dry matter than when the corn silage is 35% DM. This could compound problems with overfeeding energy via a corn silage based ration. Ration palatability: If your corn silage is too dry, you may need to make adjustments to maintain a moist, palatable ration for finishing diets. Likely, cows won't mind the extra dry ration… they will eat it. For most rations, the simplest solution could be adding water to the TMR. Another option is to utilize wet forms of co-product feeds like wet distillers grains, wet corn gluten feed, or brewers grains to add moisture and nutrients. If neither of these solutions are appealing, adding molasses is another option to improve palatability. Feeding Strategy: Offering hay free-choice is standard practice in the Midwest. Using the same free-choice feeding strategy with corn silage can result in some pretty fat ladies. Palatability of corn silage is high. Cows will consume 90-100 lbs. of silage if given the opportunity. In nearly all scenarios, that is over-feeding. Thus, limit-feeding corn silage is the best feeding strategy. Cow behavior will change. They will meet you at the front door and may bawl more because they are not full. Some guys can't stand to hear cows bawl, so they will offer cornstalks or poor quality hay free-choice. If your corn silage was harvested late, you will need to make ration adjustments to accommodate the additional DM in the corn silage. Fermentation may have been less successful. A nutrient analysis is important and will ensure proper feeding levels can be attained.